Who said lending unlocked by QE failed to "trickle down" to the general population." Well, maybe not the general population, but certainly the wealthiest 0.001%, or those who don't actually need the money. 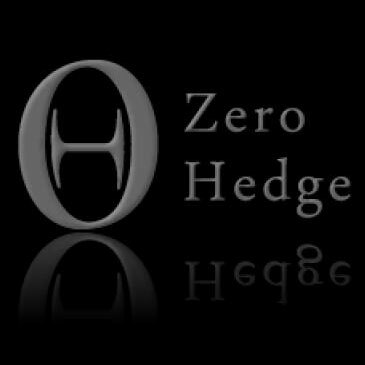 In addition of making money through "traditional" means like trading and investment banking fees, both Goldman Sachs and Morgan Stanley made it clear this week that they are also heading full-scale into the business of lending money to their millionaire and billionaire wealth management clients; in fact, lending to the 0.001% is now a key part of both banks' growth strategy. A Bloomberg report states that it can take as little as five minutes to underwrite a loan for wealthy clients who want to start a new business, pay down taxes or obtain a bridge financing for that new mansion. 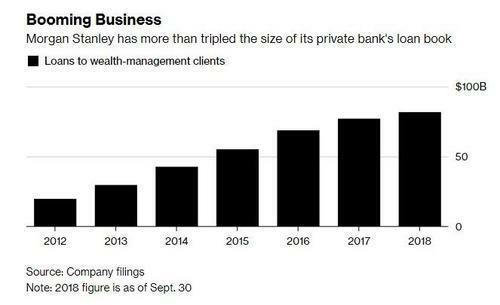 Morgan Stanley has tripled the amount of these loans over the last five years and Goldman Sachs is working on expanding this business overseas. Embracing this type of relatively risk-free lending comes as a result of banks being forced into becoming bank holding companies by the financial crisis. 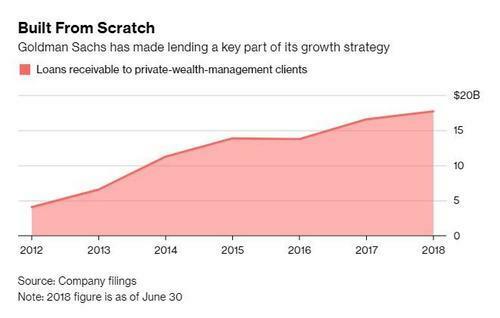 With other revenue-generating avenues narrowing, lending to wealth management customers is a key part of Goldman's plan to grow its revenue. Morgan Stanley said this week that loans in the wealth unit climbed 7% in the past year to $82 billion, and interest income jumped 22%. The bank said in a January strategic update that extending credit was a key priority for its wealth management unit, which has $2.5 trillion in assets. Christian Bolu, a bank analyst at Sanford C. Bernstein, told Bloomberg: "Relative to things like the securities trading markets that generally haven’t grown post crisis, the wealth market continues to grow and the ultra-high-net worth market is even more attractive, it grows fast and has high margins. It tends to be very bespoke; you can’t get go to your regular, mainstream bank to get loans on your artwork." To be sure, both of these banks are still trying to catch up to banks like J.P. Morgan Chase, which has provided these types of loans for decades. Deutsche Bank is also trying to hire in the United States with a commitment to lending, particularly to people with more than $100 million in assets. Credit Suisse had a $3 billion loan book in the US by the end of June, as well. Goldman Sachs stated that it sees "significant opportunities" in this area, including possibly helping Goldman turn around its stock performance and potentially generate as much as $850 million in new revenue. "When dealing with a client who on average has more than $50 million, spending a little bit of time isn’t a lot of cost relative to how much you can make on the loan", Bolu explained. While the lending business to high net worth individuals is not moving the needle significantly yet, it is starting to make an impact. Goldman Sachs has lifted its portfolio of wealth management loans to more than $17 billion in the second quarter, up from $4 billion in 2012. Morgan Stanley said that loans in their wealth unit were up 7% over the past year to $82 billion and that interest income from these loans was up 22%. In January, the bank came out and said that extending credit was a key priority for its wealth management unit, which currently has $2.5 trillion in assets. But the key reason for pursuing such loans may be to prevent the client from fleeing to the competition. Brent Beardsley, who leads Boston Consulting Group’s work in asset and wealth management, said that lending on illiquid assets binds the client to an organization. "A loan is sticky -- high-net-worth clients can’t necessarily just leave and take the loan with them, especially if it’s a hard-to-value loan." Devin Ryan, an analyst with JMP Securities, told Bloomberg that banks can then dovetail from these types of personalized loans into more illiquid assets. For instance, the market for loans backed by art is in the midst of growing. Ryan told Bloomberg that "high-net-worth accounts tend to have a higher percentage of the income and the assets, there’s typically more financial products and more financial advice in those relationships." And why not? 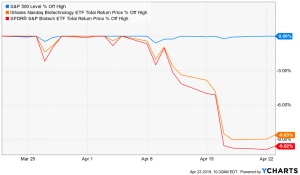 These banks all consider themselves to be "safe" thanks to the Fed's recent stress test, which estimates that Morgan Stanley's loss rate is about 2%, well below the average of all 35 banks tested. Goldman has also said that 98% of its high net worth loan book was secured. This doesn't mean that banks won't have to collect occasionally, which Goldman did last year, seizing a customer's yacht after he failed to pay a loan. Ryan concluded, "Lending always has risks because depending on whether the loan is collateralized or not, you have the risk of not being paid back. But having an existing relationship with the customer and information around their financial life allows the firms to make better underwriting decisions."